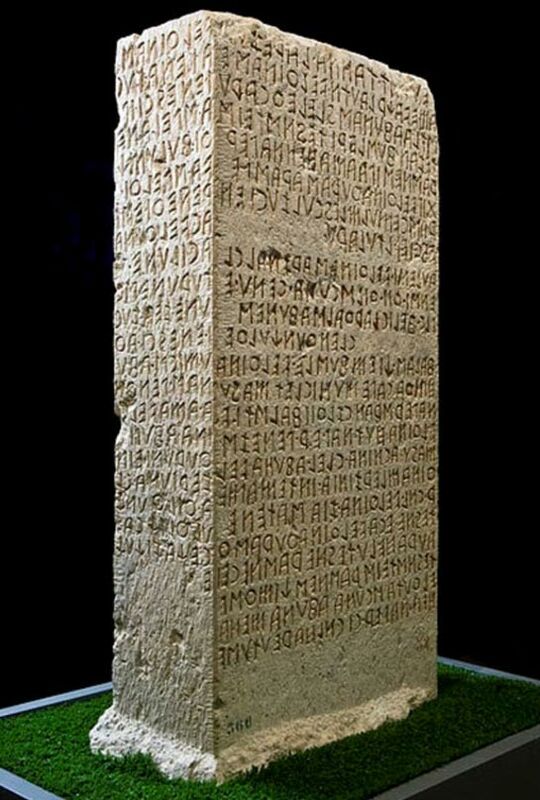 The oldest known runic inscription dates to 160 AD and is found on the Vimose Comb reading simply “HARJA”. More than 4,000 runic inscriptions and several runic manuscripts have been found with approximately 2,500 of these coming from Sweden. Many date from the 800's to the 1000's, during the period of the Vikings. Runic texts are found on hard surfaces such as rock, wood, and metal. The characters were also scratched on coins, jewelry, monuments, and slabs of stone. The Runic alphabet is known as Futhark after the first six runes, namely f,u,th,a,r and k. It consisted of 24 letters, 18 consonants and 6 vowels, and was a writing system where each character marked a certain sound. Runes could be written in both directions and could also be inverted or upside down. The earliest runes consisted almost entirely of straight lines, arranged singly or in combinations of two or more. Later runes took on more complex forms and some even resemble modern day letters of the English alphabet. Because of the resemblance to Mediterranean writing, it is thought that Futhark was adapted from either the Greek or Etruscan alphabet and its origin begins further back than the pre-history of Northern Europe. The earliest Futhark inscriptions don’t have a fixed writing direction, but instead were written left-to-right or right-to-left, which was a feature of very archaic Greek or Etruscan alphabets before the third century BC. One theory is that the runic alphabet was developed by the Goths, a Germanic people. Two inscriptions, the Negau and the Maria Saalerberg inscriptions, written in Etruscan script in a Germanic language and dating from the second and first centuries BC, give credence to the theory of Etruscan origins. The result is that runes can be pretty tricky to decipher, even by ‘experts’, especially when found incomplete or faded as was the case with a rune inscribed whetstone found last year in Norway. Eperts appealed to the public for assistance in translating the ancient script. Elder Futhark is thought to be the oldest version of the runic script, and was used in the parts of Europe that were home to Germanic peoples, including Scandinavia. It consisted of 24 letters, and was used mostly before the ninth century AD. This was the ancestor language of English, Dutch, German, Danish, Norwegian, Swedish and Icelandic. As languages changed and more Germanic groups adopted it, Futhark changed to suit the language that it came to write. An early offshoot of Futhark was employed by Goths known as Gothic Runes, which was used until 500 AD before it was replaced by the Greek-based Gothic alphabet. Elder Futhark was used until 550 AD around the Baltic and North Seas to write the language described by Antonson as ‘North-west Germanic’. Unlike other forms of runes, the skill of reading Elder Futhark was lost overtime until it was rediscovered with its decipherment in 1865 by the Norwegian Sophus Bugge. Younger Futhark or "Normal Runes" evolved from Elder Futhark over a period of many years and stabilized by about 800 AD, the beginning of the Viking Age. Instead of 24 letters, the Scandinavian "Younger" Futhark had 16, as nine of the original Elder Futhark letters were dropped. The Younger Futhark is divided into two types, short-twig (Swedish and Norwegian) and long-branch (Danish). It was the main alphabet in Norway, Sweden and Denmark throughout the Viking Age, and largely (though not completely) replaced by the Latin alphabet by about 1200 AD, which was a result of the conversion of most of Scandinavia to Christianity. Futhark continued to be used in Scandinavia for centuries, but by 1600 AD, it had become little more than a curiosity among scholars. Between 400 and 600 AD, three Germanic tribes, the Angles, the Saxons and the Jutes, invaded Britain and brought Futhark from continental Europe with them. They modified it into the 33-letter "Futhorc" to accommodate sound changes that were occurring in Old English, the language spoken by the Anglo-Saxons. The name "Futhorc" is evidence to a phonological change where the long /a/ vowel in Old English evolved into a later /o/ vowel. Even though Futhark thrived as a writing system, it started to decline with the spread of the Latin alphabet. In England, Anglo-Saxon Futhorc began to be replaced by Latin by the ninth century AD, and did not survive much more past the Norman Conquest of 1066. By the 1000's, missionaries had converted the Germanic peoples to Christianity. In popular culture, runes have been seen as possessing mystical or magical properties . Historical and fictional, runes appear commonly in modern popular culture, particularly in fantasy literature, video games and various other forms of media. Many modern Wiccan sects use Runes ceremonially and ritualistically. The ‘secret’ of the runes continues to captivate us today. "The Origins of the Runes." Norse Mythology for Smart People. [Online] Available here. "Use of Runes Survived Introduction of Christianity." ThorNews. February 5, 2015. [Online] Available here. I am a TURK. We read easily this scripts in turkish. How come that it is misterious? Of course not all runes are futhark. Look also at the Hungarian Rovas. The word HARJA in the comb means comb/brush in Finnish, I dont believe it us co-incidence.